SE corner of Church and High Sts. The “Old English Church” began as a log cabin in 1745. A stone structure called the Mecklenburg Chapel replaced the original building in 1769. Though it has gone through several renovations, the basic structure of 1769 still remains. 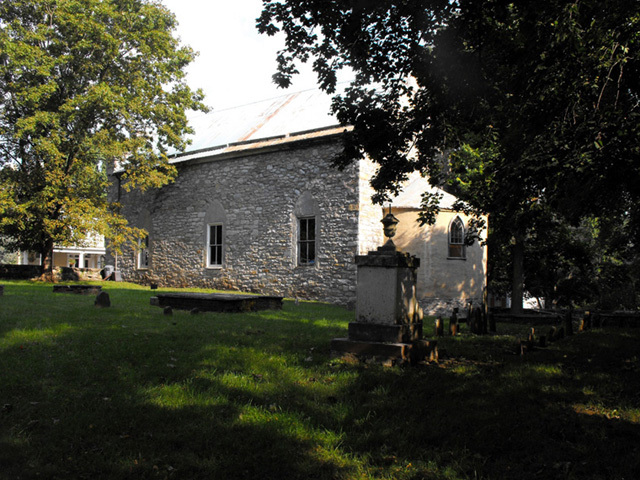 It is among the earliest surviving church buildings west of the Blue Ridge Mountains. The town’s founder, Thomas Shepherd, willed the lot upon which the structure stands to the church parish in 1776. After the Revolution, the building fell into neglect with the disestablishment of Anglicanism in Virginia. In about 1815, the church was rebuilt. The first use of the name Trinity Church appears in the records in 1836. A clock given by Rezin D. Shepherd remained in the tower here from 1841 to 1858. After the Civil War, the Old English Church became the first Freedman’s School and the African Methodist Episcopal Church. The original steeple blew off in a storm in the 1890s. Today the property is privately owned.